Trust this note finds you and Lilian in the best of everything. Looks like you’ve managed to get out fishing a few times while I’ve been on holiday and that the fish have been largely cooperative. Great result. We managed to fish 6 times during our 12 day holiday at Cooper's Beach and the results ranged from dismal to outstanding. As always, the fishing was influenced heavily by the conditions. On the whole the weather was excellent, aside from two torrential downpours. Unfortunately these two downpours flushed huge amounts of sediment into Mangonui harbour and Doubtless Bay which turned the water the colour of milk chocolate and made it difficult to locate feeding fish. In fact, the Mangonui harbour was pretty much unfishable for the duration of our stay which put paid to my plans to explore it on foot at low tide. The first rain arrived the day after we reached our holiday accommodation (bach). 180 mm of rain fell in 12 hours and it was accompanied by wind and heavy seas. Five days later we copped the tail end of cyclone Wilma which dumped a whopping 280 mm of water in 12 hours. The flooding from the Wilma event isolated the far north of NZ from the rest of the country for two days and forced Hamish out of his bedroom in the bach on account of the flooding. Serious stuff! Our first session could be summarised as the calm after the storm. We took the boat out from Mill Bay in the bright mid afternoon sun with the express aim of fishing the tide down to low. The conditions outside of Mangonui harbour were fairly choppy as the wind was gusting 15 – 20 knots. We opted to drift fish close in and focus on prospecting the foam line which had formed where the dirty water exiting the harbour met the vast expanse of Doubtless Bay. Sandy, Hamish and Tim chose to fish with cut bait (pilchard and mullet) and shellfish (fresh tuatua) on a paternoster rig whereas I plumped for soft plastic threaded onto ½ and ¾ oz. jig heads. 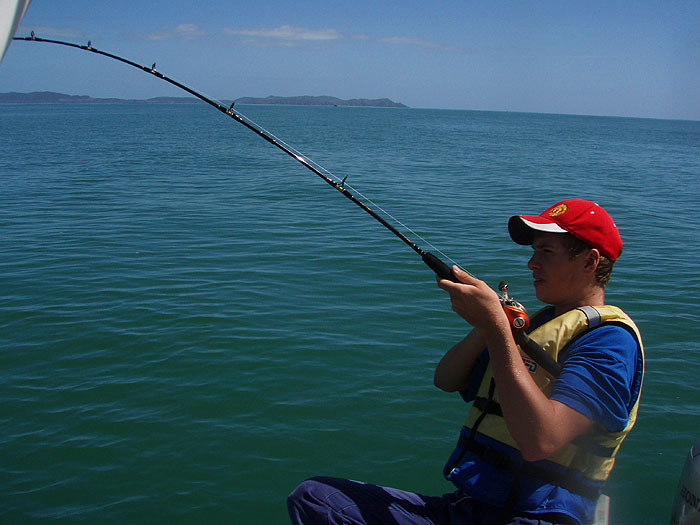 The bait fishermen were soon pulling in a fairly regular stream of undersize snapper, kahawai and yellowtail. We kept the yellowtail for bait but released everything else as quickly and painlessly as possible. I couldn’t buy a bite and spent most of my time in the intervening two hours riffling through my tackle bag trying to find a soft plastic combination capable of tempting a larger fish. Eventually I settled on a chartreuse jig head and Smoke grey Slug-Go which got nailed almost immediately mid water by a 3 lb kahawai. The fish put up a spirited aerial display but was no match for the heavy drag setting and quickly succumbed to join us at home for dinner. This ended up being the only decent fish of the session. We even tried trolling bibbed lures for 45 minutes in the hope of picking up something more substantial. We launched the boat from Mill Bay and motored out of Mangonui harbour at 9.00 am to be greeted by a calmer sea that was punctuated by a nasty short chop. The sky heralded approaching bad weather and the wind was building so we opted to again stay close and fish the line of delineation between the harbour outflow and the bulk of Doubtless Bay. Tim had baited up a crab pot so we set this early in the session in the hope of snaring some tasty paddle crabs for dinner. On the drift things proceeded much the same way as the previous day with the bait fishermen catching enough small snapper and kahawai to keep them interested. After an hour or so Tim decided to up the ante and added a larger lump of mullet onto the top hook of his paternoster. On the drop the larger bait was spanked by a better fish and line poured off the spool as it sought it’s freedom. The rod tip was nodding like a thistle so it was obvious immediately that he was fast into a respectable snapper. A game of too and fro developed until the drag and rod pressure finally took toll, whereupon a nice 4 lb snapper surfaced near the boat to be swiftly scooped up by the landing net. Hamish got in on the act shortly afterwards on the drift and in short order persuaded a 2½ lb kahawai to join the snapper in the chilly bin. Meanwhile I was changing plastics like a man possessed, desperately seeking find the successful combination to break my duck. As my frustration built so did the taunts from the crew about the effectiveness of plastic versus bait with Hamish leading the charge. The things I have to put up with!!!! In the end we gave up and headed back into the harbour for lunch with me still fishless. There was a queue at the boat ramp so we were forced to idle about in a holding pattern until our turn came to retrieve the boat. Never one to miss an opportunity to cast a lure, I took my soft bait set from the rod holder, added a Binsky blade and flicked it in between the moored boats. Two rips was all it took to hook up and almost immediately a 4 lb kahawai took to the air boat side. Next it bored down to the bottom and headed for the nearest mooring rope but I’ve been there many times before and locked up the drag with my reel hand. The fish turned immediately as soon as the pressure came on and headed back to the surface for another burst of tail walking. This took most of its remaining fight and within a couple of minutes it was drawn boat side to be netted and despatched. You could hear the jaws on the jetty and in our boat collectively thud open at this point. Never say never and always fish your feet! Reputation saved....? In case you were wondering the paddle crabs avoided our pot. The barometer had started to drop heralding the imminent approach of cyclone Wilma and the building sea was too rough to comfortably fish in, so Hamish and I decided to fish in Mill Bay near the boat ramp. Hamish had visions of carnage based on my last cast success the day before but we ended up blanking. I suspect that the fish knew a storm was nearly upon us and had “battened down the hatches” in anticipation. Two days after the cyclone we finally ventured out again from Mangonui harbour. 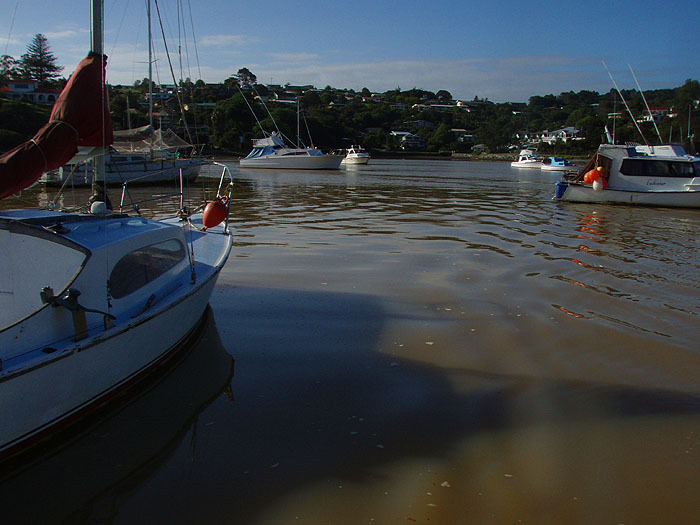 The inner harbour was the colour of chocolate milk but you could see that this was a surface phenomenon as the outboard motor was creating a clear path behind the boat as it spun the sea water upwards from below the muddy surface layer. 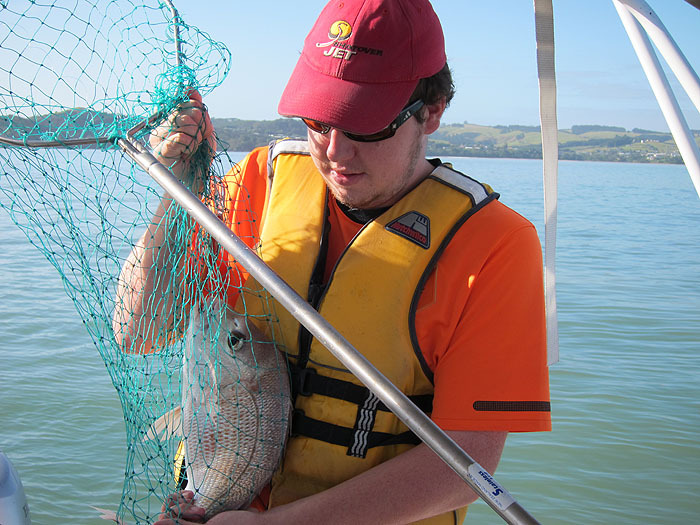 We had decided to fish the tide down to low and head out to deeper water across the glass calm surface of Doubtless Bay. Rather than simply motor out directly to the distant Fairway reef, we decided to leisurely troll bibbed Rapala deep diving lures at 4 knots in the hope of picking up a stray kahawai or small kingfish. Halfway to our destination Hamish yelled that he was on so we took the outboard out of gear and settle in to fight his fish. It pulled line in sustained bursts but did not head to the surface as a kahawai would. 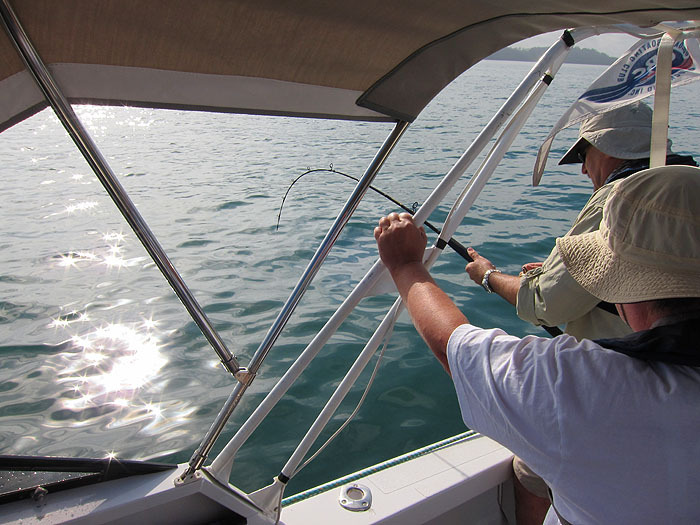 The rod tip was nodding, but not vigorously, so we were all bemused as to what he’d hooked. Eventually after a few minutes of heavy pumping he was able to break the deadlock and bring the fish to the surface. Imagine our surprise to see a healthy 3 lb snapper attached to the Rapala lure. First time we’ve ever snared a snapper trolling. The water depth was only 12 metres so the lure was probably tracking mid water when the snapper struck. Very interesting. We continued to troll unsuccessfully towards our destination until the fish finder showed massive sign when the depth reached 23 metres. Out went the drogue and we started a slow drift at the mercy of the now flaccid breeze. I opted for a Slug-Go on a 5/8 oz jig head and lobbed it ahead of the boat to allow it to sink to the bottom before we passed over it. The Slug-Go never reached the bottom and got monstered midwater by a solid fish. Line poured off the spool as the fish sought its freedom by heading to the bottom. Fortunately the bottom was not overly rocky so I could allow it to run rather than lock up to turn its head. Judging from the movement of the rod tip, I was attached to a middling snapper and this proved to be the case once I gained control and brought it steadily to the surface. At 4 lb it was solid table fish and was despatched to the chilly bin. Unfortunately the Slug-Go was damaged beyond repair so I replaced it with a 3” Zoom Smoke Grey shad. This lure got purloined first drop by another 3 – 4 lb snapper and did the business on the next two casts. 4 casts = 4 snapper. Primo! Tim, Sandy and Hamish all managed to land slightly smaller fish on mullet bait during the course of the drift before the action slowed. We retraced our path and drifted again but by now the wind had started to rise. I caught a decent kahawai (4 lb) early in the drift on the Zoom lure but then started to lose lures to squid which were nipping off the tails and gouging hunks from the main body rendering them useless. Tim switched to soft plastic at this point and managed to land a 2 lb kahawai almost immediately on a Tsunami holographic squid (3”). Hamish lost a squid jig trying to catch the lure-destroying hordes before we decided to head home for lunch and a swim. As we ambled down for our swim we bumped into a Manchunian fisherman surf casting amongst the bathers and he made a most humorous sight as he lolled in the margins between casts on a child’s inflatable sea horse. After the swim Tim loaded the lobster pot with fresh fish frames and kayaked out to drop it near the rocks at the end of our beach where we’d seen a crayfish captured earlier in the week. The wind was getting up when we left the harbour the following morning, which made the lobster pot almost impossible to retrieve safely with the boat. Ever the lateral thinker, Tim stripped off to his underwear, swam to the buoy and then swam it back to the boat where we hauled it in quickly. Unfortunately a small rock fish was all that adorned the pot. The worsening weather made it hard to drift fish but we were determined to give it at least one run before heading back into the safety of the harbour. I managed to nail another 3 lb snapper on the Zoom, lose another lure to the voracious squid population and miss three solid strikes on this solitary run. So the fish were on! The bait soakers drew a blank so it was payback time. Judging by the pattern of damage I suspect that the snapper were taking the lure head first on the drop which made it hard to set the hook. On our way back in we were treated to the sight of a pod of dolphins bow surfing in front of a large launch which made our morning. The dolphins were all huge, estimated at 6 – 8’ long. The day dawned clear and still so we rapidly wolfed down breakfast and were out on the water fishing by 8.30 am. Again we trolled out of Mangonui harbour and this time almost immediately spotted our first 'workup' of the trip. I reeled in my Rapala as we approached the working kahawai and picked up my soft-bait rod whereas Hamish decided to keep trolling. Tim swung the boat parallel to the kahawai shoal and I cast ahead with the Zoom soft plastic. It would only have dropped about 2 feet through the water column before it was inhaled by a fast charging kahawai which hit the after burners as soon as it felt the hook. This fish spent the next few minutes cavorting across the surface thrashing the water to foam. Eventually it decided to dive but had expended so much energy that the run was tepid and easily controlled. Boat side it was a fine 3½ lb fish so was netted and despatched for the smoker. Hamish proceeded to hook and landed three small kahawai in short succession before we opted to leave the work up and head out into deeper water while the sea was still calm. As we neared the spot where we had been successful in session four the surface erupted as a school of large kahawai carved a path through a ball of baitfish. Out went the Rapalas and within twenty metres I was hooked up to a feisty 4 lb kahawai. The fish headed to the boat showed on the surface and headed deep on a searing run which seemed to get faster and faster. All of a sudden the rod bucked double, the weight increased alarmingly and the braid began to sizzle from the spool and crackle as it scythed through the guides. I knew what had happened almost immediately. 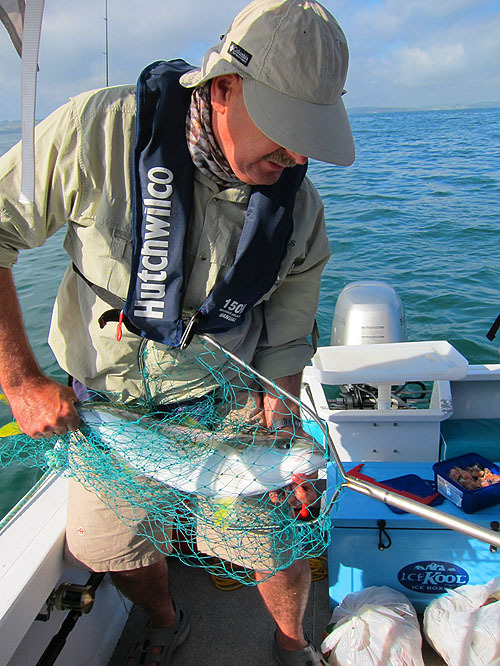 The 4 lb kahawai had been snaffled by an XOS kingfish and I was now hooked up to a leviathan. The kingfish dragged still more line from the spool of the Calcutta as it surged powerfully away from the boat. Yeehaa!!!! I tightened up the drag, got Tim to fit the gimbal belt and hung on for all I was worth. The rod bent into a fighting arc and the big fish charged away again. Eventually it settled down and a stalemate ensued. I’d gain two inches of line and it would pull 6 inches back. To gain more than 2” I had to thumb clamp the spool and short stroke and every time I did that the fish dragged all of the gains back with interest. After about 15 minutes of struggle my arms were burning but I was starting to make progress. Inexorably the fish was lifting through the water column and I could feel it tiring. The lifting continued for another five minutes until I had the nylon trace (I was fishing with a trace of 30’ of nylon) on the spool. The fish then saw the boat and headed off at warp speed on its final run. At this point the small treble of the Rapala that must have pinned the kingfish felt the full weight of the charge and simply corkscrewed out of the fish. I was gutted. 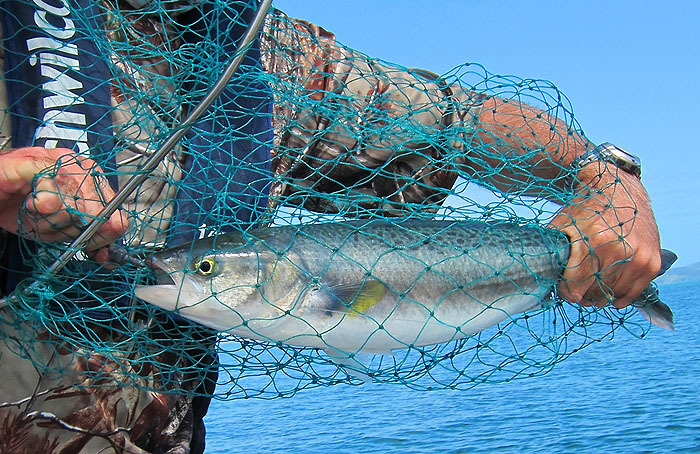 I’d tackled up for kingfish and when one came along it took a kahawai lure via the mouth of a hooked kahawai. 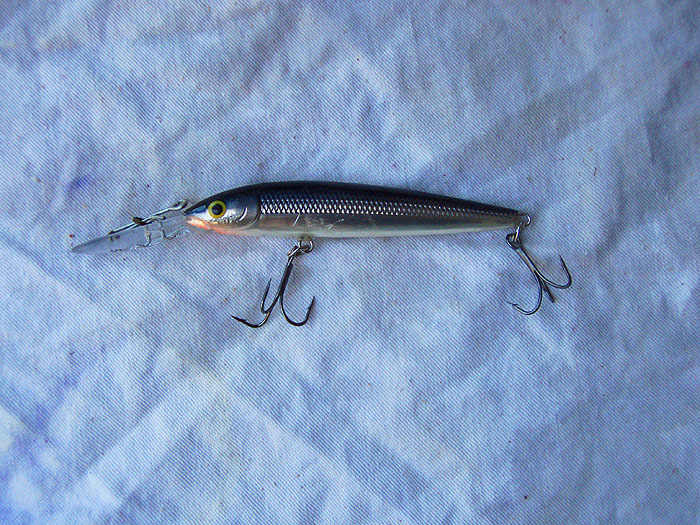 In disgust, I wound in the damaged lure, attached it to the bottom guide and stowed the rod. The fish were still going ballistic around the boat so I picked up my soft bait rod, adorned with trusty Zoom Grey smoke shad, and lobbed the lure into the maelstrom. Hook up! The line sped off the spool as the fish headed for the bottom as fast as its large yellow tail would propel it. This was no kahawai. I was hooked up to another decent kingfish and it was none too pleased to have a 3/0 hook impaled through its upper lip. Two fish in two casts. I thought to myself “It doesn’t get better than this”. This fish was heavy but was clearly not a monster. It took about 5 – 10 minutes to bring it to the net where it was measured (~ 70 cm = 8 lb) and carefully released. While this was going on Tim had nailed a 3 lb kahawai on a Lucanus jig and the bait soakers were threading on mullet strips like their lives depended on it. To cut a long story short the next drift was a revelation. I landed a 4 lb snapper, Sandy caught two mao mao and a parrot fish and Hamish boated two smaller snapper. Tim was now fishing soft baits and lost a couple to the voracious squid. He switched to a squid jig in an attempt to snare one but never had a touch. By now the wind had got up and it was time to head back in shore. I’d lost at least 5 lures to the squid so there must have been a lot present and this probably explains why there were so many active fish available. In between the fishing and bad weather we’d collected tuatua and made fritters, plucked mussels from rocks and smoked them, visited a winery and had some award winning kai (Maori word for food). The weather was warm as was the sea. All in all we had an awesome time in the far north. That's how I like a fishing holiday - build up the suspense over the first few sessions and then hit the big fish at the end. A bit of a downer when the monster escapes of course but that, as they say, is fishing.